When my daughter Kate went to her ten week checkup, Maggie insisted one of her hips seemed stiffer than the other. I tended to agree one was a bit stiffer, but didn’t think much of it. The doc had a good look and said it seemed okay, but Maggie insisted so we got a referral for an ultrasound. Everything at the imaging place was quite cheery until all of a sudden the radiographer went a bit quiet and said she would just go and get her boss. I thought “oh bugger” and we were informed that Kate had hip dysplasia. She had a few weeks in a velcro harness which we were told fixes 99% of these problems, but unfortunately Kate was in the unlucky 1%, so had to have an operation ending in 6 months in an armpits-to-toes plaster cast. Two things about that operation: Firstly, I will never forget the lookÂ Kate gave us when she realised the very nice nurse was taking her into the operating theatre and secondly, just an FYI to doctors, after an operation on the child of new parents, the correct order of theÂ first two announcementsÂ you make is not “you had better sit down” THEN “everything is fine”. This is definitely exactly the wrong order of delivery. Anyway, we had what we referred to as our “potplant baby” for a few months during which her attempts to start crawling were inspiring and heartbreaking in equal measure, and I also invented the “stuff the turkey” song for nappy changes which were quite an operation, and you did need a bit of a sit down afterwards. The surgeon gave her hip the big tick and it’s all normal, except a slightly enhanced level of flexibility meansÂ she is capable ofÂ chewing her toenails,Â though she mostly doesn’t. 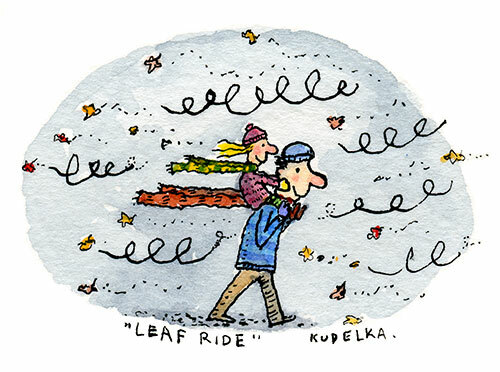 The relevance of all this to the pic is that she was now able to have shoulder rides (rather gingerly at first though the doc assured us we couldn’t stuff her hip up) and thisÂ drawing comes fromÂ aÂ vividÂ memory ofÂ one blustery early winter ride with her gigglingÂ at passing leaves and attempting to pull my ears off. Originals and prints available from the Phone Box Gallery.